I hope we find this situation unacceptable — that we not just shrug and say that’s the way it is, that’s the way it has always been, and that’s the way it always will be. Jesus is about redemption, both eternally and temporally, brought hope and healing, love and forgiveness into our world and instructed us to do the same. — Cops have a tough job, a very dangerous job. They need our respect and honor. Churches should provide safe and encouraging spaces for cops to talk about the challenges of their jobs. — Cops should be paid well. We shouldn’t put badges on chests and guns in holsters without treating the job as worthy of good pay, hazard pay. — Cops should be required to have a certain level of education and undergo continuing training in psychology, mental health, cultural competency ethics, safety, firearms, communication, and more. This is a tough job, and tough jobs require lots of training. It is important that our laws be just and that they be enforced in a just manner. Law enforcement officials are an important link in our criminal justice chain. Let’s pray for them, support them, honor them, and expect the highest from them. They serve and protect, we owe them nothing less. I stumbled across a web page the other day that created a deep sense of sadness within me. It’s a page of theTampa Bay Times which presents mug shots of people arrested in the area. Five mug shots appear near the top of the page. When you click on the photo you are taken to information about the person including name, age, birth date and criminal charge. There is an arrow to the right of the five mug shots, which, when clicked, takes you to another five, and then another five, and then another five. On the day I saw the site the crimes included driving under the influence, driving without a license, battery, prostitution, drugs, grand theft, misdemeanor theft, and on and on. Two categories of offenders caught my particular attention because their faces had the look of shattered lives — those arrested on drug charges and those booked on prostitution. It’s what their eyes “say” that is shocking; it’s as if their souls are crying out for help in the midst of desperation. You also could see the difference between the prostitutes in their 20s and those in their 30s and 40s. The younger ones were often attractive, but with the older ones you could only see shadows of a beauty that had passed away sometime in the woman’s past. It was not just a matter of age taking its toll; it was much, much more than age. Looking at these women, I hurt for them and I wondered if human trafficking had played into the destruction of their lives. Confronted with such a terrible reality, those of us who follow Christ know that none of these offenders and the thousands more like them around the country are beyond the love of God. No matter how low these fellow children of God may have slipped, Christ can still bring purpose, fullness, and hope to their lives. Redemption always is possible. The jails and prisons of our communities are full of people who need to feel the love of Christ that has so changed many of our lives. And there are many others in our communities who are on the verge of being behind bars because of lifestyle choices. Good “church people” are needed more in these places than they are in church buildings. A prayer: Help us, Lord, to help those who need Your help. There is a young man out there who is a fugitive from justice, and he probably doesn’t even remember his fifth-grade crime. I remember it because when you make a man’s daughter cry, you can make that man rather angry. It was not a serious crime, and the victim laughs about it now. But, the case has remained unsolved for all these years. It is a “cold case” in our family annuls, but it remains in the file. The crime: A stolen baseball card. It was lifted from my daughter’s backpack at school, which makes it count not only as a theft but as an invasion of privacy, as well. The stolen item: An Ozzie Smith card. For the non-baseball fan, Ozzie was the star shortstop of the St. Louis Cardinals back in the 1980s and early 1990s. He amazed fans with his defensive prowess, and he performed a somersault as he ran onto the field at the start of each game. He’s now in the Hall of Fame. The victim: Tabitha. She remembers and still has a list of suspects filed away in her powerful brain. The suspects: All of them are about 28 or 29 years old now; they like baseball or once did; and they attended fifth grade in Chatham, Illinois. I have made the assumption the criminal is male, but you never know. 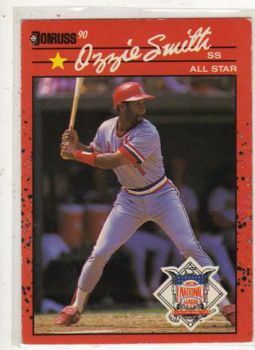 In the larger scheme of things, that Ozzie Smith card crime is not a big deal. But even little crimes hurt, because crimes involve victims. I have been burglarized and stolen from, but I cannot imagine what it feels like to be the victim of violent crime or to have someone you love victimized violently. Even with non-violent crime the victim is left feeling violated and vulnerable, weak against a malevolent strength, angry but with no way to express the anger. Violence must compound those feelings. Crime separates people. It pits one person or a group of persons against another or others. It can be a holdup in a dark alley or a theft of thousands through fraud. The criminal becomes the enemy of the victim, and you wonder if the criminal already saw the victim as an enemy. I hope the child who stole my daughter’s baseball card did not continue to think he could simply take what he wanted in life. I hope he learned to give and not to take. But if he didn’t I pray he will come to understand that a giving life is a much better life. Maybe he will run across that stolen card in looking through his past and realize that something is missing and turn to Christ for help. If so, then that will be a very valuable baseball card, at least to him. Unless it was a her. 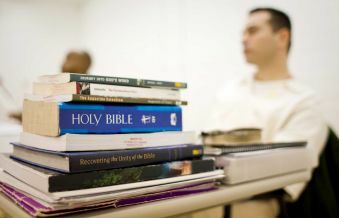 Faith-based programs are having a positive impact in Texas prisons, and the leaders of one such program have written a helpful opinion piece in the Houston Chronicle. Texas Baptists are highly involved in faith-based efforts, with funds provided through the Texas Baptist Cooperative Program and the Mary Hill Davis Offering for Texas Missions. Our efforts seek to have a life-changing impact on inmates and their families, but we also seek to make sure these efforts are pursued in a manner that respects the important principle of separation of church and state. The Chronicle piece by Kirk Blackard and John Sage gives the staggering numbers regarding incarceration in the United States and Texas, but it goes further. It speaks of the inroads into recidivism rates in Texas and how this is tied to state funding. “Nationwide, about two-thirds of released prisoners are rearrested within three years, and about half are locked up again,” Blacker and Sage said. In Texas, about half of inmates will be rearrested in three years and 28 percent of those will be re-incarcerated. Those numbers are inexact, but they show Texas is doing something right in its prisons; we are doing better than most of the rest of the nation. This is good news for the prisoners; it is also good news for Texas taxpayers because it costs a lot of money to put criminals in prison. The economics of this can be lost in the state budgeting process. During the last session of the Texas Legislature in 2011, the Texas Baptist Christian Life Commission helped turn back an effort to cut all chaplains from the Texas Department of Criminal Justice budget. The proposed cut in chaplains came from TDCJ itself. Fortunately, the Legislature had more wisdom than TDCJ, because once the situation was made clear to them, funding for chaplains was restored. “Unfortunately, the state’sbudget woes are leading to major cuts in the very programs that help reduce recidivism, suffering and cost. Budget reductions in the Texas Department of Criminal Justice have been largely focused on community supervision, parole and programming funds. Even the department’s ability to process new volunteers for work in prison programs has been impaired. It appears the goose that could lay the golden egg is being killed by short-sighted legislative policy. “There is a better way. Some people need to be locked up to protect society – and many for a very long time. But the tendency of tough-on-crime advocates to lock up more and more people for longer and longer terms for smaller and smaller offenses, while de-emphasizing the programs aiming to rehabilitate inmates and prevent their return to prison, is misguided at best. Sage is the founder and executive director of Bridges To Life, a faith-based restorative justice program headquartered in Houston; Blackard is chairman of the Board. They are part of a broad-based effort for Texas to be smarter in how we deal with crime, punishment, and rehabilitation. The latter, indeed, is possible. We Christians, with our belief that transformation of sinners is indeed possible, should be and are leading in this effort. The size of a prison cell shocks the brain on first site. Nothing in TV and movies prepared me for that simple shock the other day when I visited a prison for the first time. I’ve seen much bigger closets. What does living in a cage do to a man? Many, if not most, of the men probably behaved like animals in the first place in order to end up in such a place. So they surely earned their punishment, assuming they received justice through our courts. But it still hurts to see human beings living such inhuman lives. Another jolt to the system comes in seeing the old men. One assumes that the older inmates have probably grown old behind the bars. For those of us on the outside, life seems to move so quickly and ends up being so short. I wonder if it is the same for the long incarcerated. The Texas prison I visited, however, is not all sadness. I visited with a couple of prisoners in regular cells who are Christians. Their eyes look different from the others. There is hope. Then I visited a faith-based dorm where I saw more than one man not just reading, but studying his Bible and taking notes. These men don’t have to live in the closet-sized cells because they are not a threat to one another. Each man has his own small cubicle with a bed that can double as a couch. The expressions on their faces are different from the others. Some still have the body paint so prevalent elsewhere in the prison, but they are different. These men are being changed from the inside out. I met one young man named Michael. It doesn’t take long to see that Michael is a man of intelligence and leadership ability. He is articulate, and his eyes are alive even though a tattooed tear is affixed below one eye. He is a believer, and you get a sense that this man has the potential to do great things for God – in prison for now and someday on the outside. And the prison staff was great. A number of them are believers, and all seemed competent, efficient and serious about their business. They have tough jobs made necessary by the behavior of the men now behind bars. And I found myself with a profound appreciation for these men and women. The prisons and jails of Texas present an amazing mission field for us to consider. When you take into account offenders, their families and the officers who guard them, you are looking at about one-fourth of the population of our state. And this is a population with a lot of hurts and not enough hope. There are many believers among that group, but there are so many more who need what Christ has to offer. Every year, 72,000 offenders are incarcerated and another 72,000 are released. This in-flow and out-flow has unique needs and present a special opportunity for those of us who follow Christ. Jesus himself made it clear that his disciples will care for the prisoners , the orphans, the widows and others in need. Lots of us, I think, could be better disciples.